Well-kept and well maintained 3 bedrooms and 2.1/2 bathrooms Villa in Cabrera with space for a private swimming pool or Jacuzzi or both. The property is in excellent order throughout and sits on a freehold plot measuring approx. 1,292.85 mts2. It has lots of terracing with stunning panoramic views of the Sierra Cabrera mountains and Cortijo Grande. 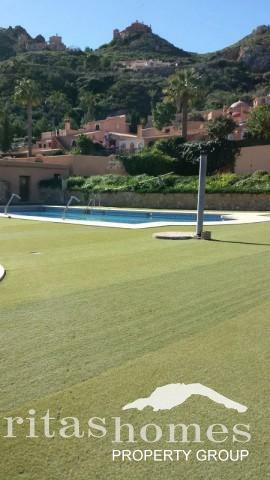 The property is being sold with shares in Cabrera community swimming pool and the vendor´s Ford C-Max. The villa has a total built area of 165,55 mts2. Internally it has a good feeling of space distributed between living room with a wood burner, a separate dining room, kitchen, master bedroom with an en suite bathroom, second bedroom, utility / laundry room, store room and a cloakroom. The third en suite bedroom is separate from the main Villa and it has a complete independent entrance. The property also benefits from a covered car port, several terraces, covered storage area used for firewood storage, an under-build under the front terrace that is currently used as a workshop, and so on. 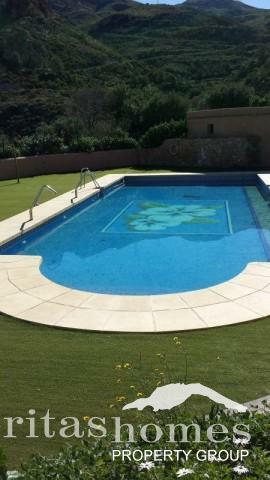 The property benefits from a large and extremely well-kept mature gardens. This is a very good opportunity for those looking to buy a full-time or holiday home that is virtually immaculate and offers great potential. . This property also has air conditioning, built in wardrobes, BBQ area, etc. The private drive leads to an area big enough to park several cars, etc.